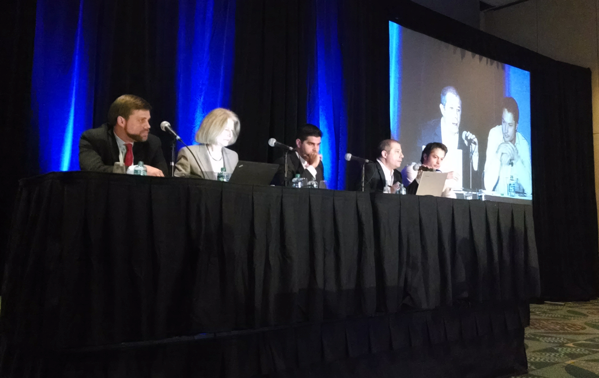 Day Two of the North American Bitcoin Conference in Miami was packed full of speakers and panels. The two halls at the Miami Beach Convention Center kept attendees on the move. In the promenade areas, a number of bitcoin and cryptocurrency-related businesses were showing off their product and services. In turn, the Miami Beach area served as a vacation-like backdrop for the event, with parties held on the rooftop of the Clevelander Hotel on both Friday and Saturday night. Even so, the conference schedule of the second day seemed to move at a frenetic pace, with few breaks in between. Here are some of the highlights. One of the most popular speakers during Day Two of Bitcoin Miami was Charlie Lee. 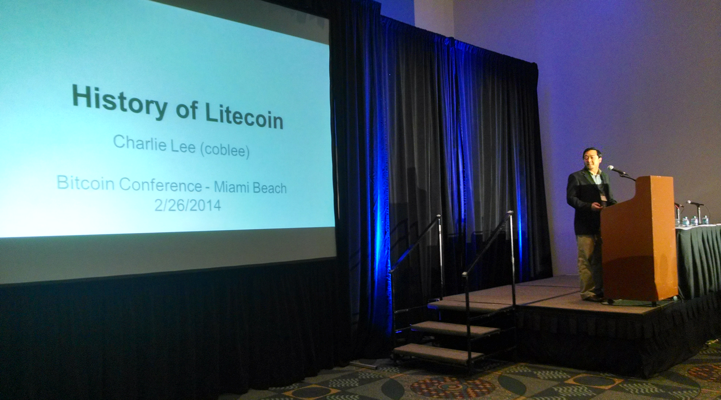 Though Lee now works at Coinbase, he was responsible for the creation of litecoin, which he named the “lite” version of bitcoin. “Some people call me Satoshi Lite,” he joked to the audience. While working at Google, he says that his litecoin project was “an excuse to learn the bitcoin code”. He had faith that he “could launch a coin that was better” than other alternative cryptocurrencies. Lee said that building the currency upon the bitcoin’s source code has allowed litecoin to adopt bug fixes and other updates to keep it relevant and grow its popularity. Charlie Lee’s presentation about litecoin. In addition to having a different proof-of-work than bitcoin, Lee pointed out that litecoin has 4x the transaction speed and 4x the total coins of bitcoin. Litecoin has reached a $1bn market cap and a 300x increase in price, according to Lee. He believes that litecoin could be a payment alternative to bitcoin just like there are different types of credit cards. Merchants will likely “accept bitcoin and litecoin just like merchants now accept Visa or American Express,” he said. And Lee is optimistic about litecoin’s future in light of ASIC mining coming to the market sometime soon, he said: “ASIC is not as scary as people think”. Lee was keen to add that there are currently “no plans” for litecoin to be implemented with Coinbase, but that it’s only a “matter of time” before this will happen. There were mixed opinions on the potential of alternative cryptocurrencies, a much-discussed topic during the second day of the Miami conference. In the morning, developer Vitalik Buterin introduced his new cryptocurrency platform Ethereum. 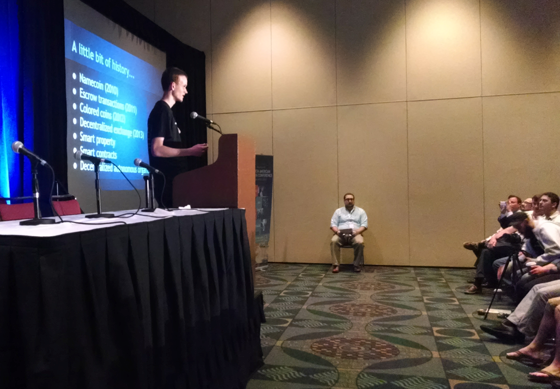 Buterin told the audience that there are “serious scalability issues,” when building on top of bitcoin. “Bitcoin was never designed for TCP/IP,” he said. Buterin likened bitcoin to SMTP, the Simple Mail Transfer Protocol for email systems that is a protocol built on top of TCP/IP. Since Vitalik’s belief is that bitcoin was “not designed as a foundational layer”, he conceived Ethereum, a platform that works upon the concept of contracts that act as an automated agent. Vitalik Buterin talking about Ethereum. He also said that Enthereum has a more powerful scripting language for developers compared to bitcoin. One of the uses for Ethereum, he said, was to build sub-currencies for very specialised purposes. “Let’s not have one currency. Let’s have 1,000s of currencies,” said Buterin. Not every speaker at the conference was overly positive on the concept of the growing number of alternative cryptocurrencies. Angel Investor Brock Pierce said during his talk that altcoin “fragmentation” could be a concern for bitcoin’s growth potential going forward. Yet he remained positive about bitcoin’s price in the future. “We’ll see a $5,000 bitcoin in 2014, perhaps $10,000,” he said. There is a degree of uncertainty towards what policymakers will do in regards to decentralised currency regulation. As a result, compliance-related topics are always a popular at events like these. This was made crystal clear during the regulation panel during Day Two. The panel consisted of Carol van Cleef a partner at Patton Boggs LLP; Jacob Farber, senior counsel at Perkins Coie; David Aylor, a Silk Road-representative criminal defense lawyer; and Gabriel Caballero, an associate at Gunster Law. The session was moderated by Paul Buitink. “The SEC has been relatively quiet,” said Caballero, who made the point that the Securities Exchange Commission (SEC) will likely have a big role in securing cryptocurrencies. That particular process will allow investors to have better access to of bitcoin, but will definitely draw scrutiny from the SEC. Caballero believes that the unique nature of distributed money means different government organisations will have to be involved and must collaborate in order to enact cohesive policies. “When you say ‘regulate bitcoin’, that is a very broad statement,” he said. The law firm Perkins Coie is currently representing a number of bitcoin-related startups. Senior counsel Jacob Farber believes that compliance issues will have to be taken care of at some point. “We have to assume that this will be a problem that solves itself,” said Farber. “This industry is moving at light speed,” Nicolas Cary, the CEO of hosted wallet Blockchain.info, remarked during his session at the end of Day Two. Cary announced that developer and bitcoin advocate Andreas Antonopoulos is joining the Blockchain.info team. One of the things that Antonopoulos will likely be working on are technical security elements such as multisignature transactions. 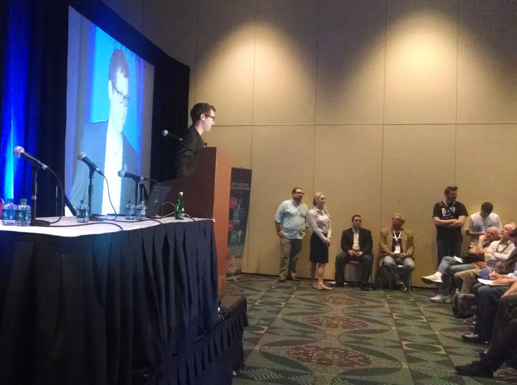 “Multisig is definitely on our radar,” Cary told the audience. The company already has amassed 1.4 million users, according to a spokesperson. Cary said that the future success of bitcoin adoption will have to do with developers building accessible applications. “We need you to build beautiful and simple products to make bitcoin fun,” he implored the audience. Nicolas Cary of Blockchain.info answering questions from the audience. Cary was the last speaker at the conference before closing remarks were made. The conference schedule concluded with organiser Moe Levin, who talked about the impressive attendance numbers. “We expected 500, we got 1,200. A lot of the ticket sales happened just two days ago,” he said. 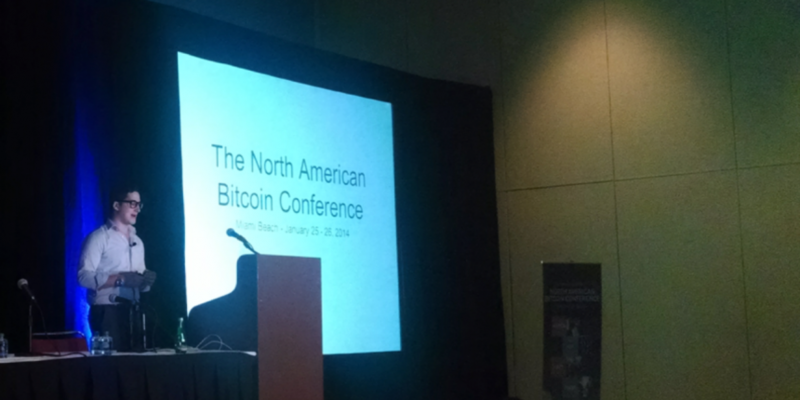 The North American Bitcoin Conference was, in the end, an opportunity for attendees to learn new things about cryptocurrencies and network with like-minded enthusiasts. In those respects, it did not disappoint. The fact that it was held over a weekend in Miami, where temperatures averaged a comfortable 70 degrees, certainly helped.